23-storeys at Brant/James compared to City Hall. Analysis & Opinion – The recently approved 23 storey building on the corner of Brant & James Street is just the beginning of highrises downtown, based on the proposed downtown precinct plan which will be discussed at committee Nov. 30 at 1 and 6:30 pm. The plan is expected to be approved in January, with more detailed Area Specific Plans coming in June 2018. What you can do? Register as a delegate to speak on Nov. 30 for either the afternoon (1pm) or evening (6:30pm) sessions to voice your views. Changes to the plan will have to be made by motion at this meeting, which I’m prepared to do. Read highlights below, and search your area for changes . 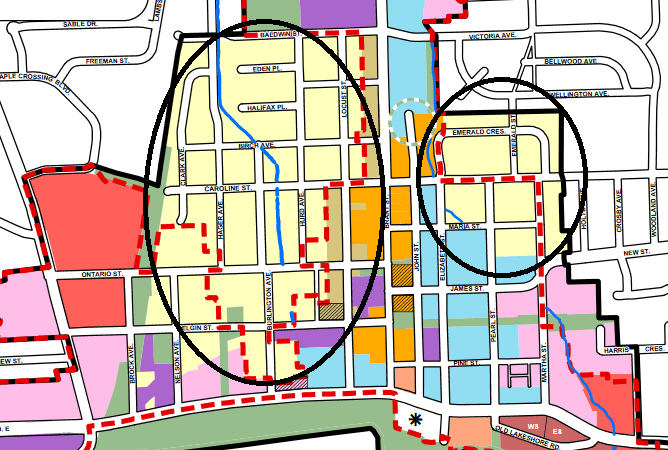 Black line is existing Urban Growth Centre boundaries; red line is new boundaries, expanding into stable neighbourhoods. 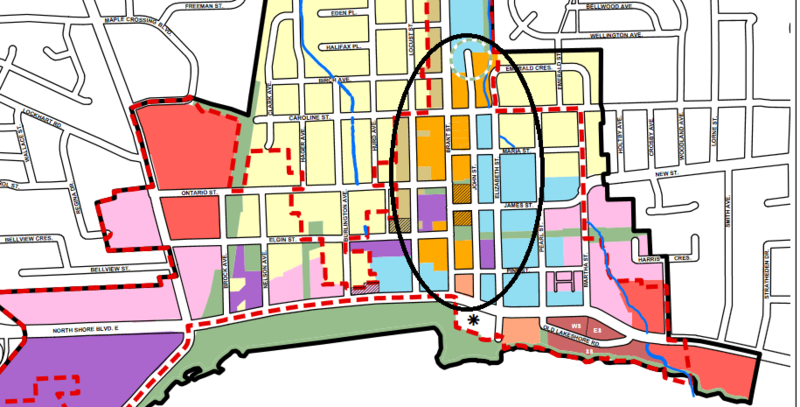 The downtown urban growth centre boundaries have changed to include parts of the stable low density neighbourhoods in the Emerald and St. Luke’s precincts. This is very serious as it will put pressure on these neighbourhoods to meet the growth centre’s target of 200 people or jobs per hectare. This change was apparently done by the province and region in 2006 and has not been reflected in our current OP, nor even come to light until now. Existing permissions are 4-8 storeys, will now be up to 11. There will be a 3 storey limit on Brant with potential to terrace back to 11 storeys facing John St. or Locust St. using a 45 degree angular plane from Brant. 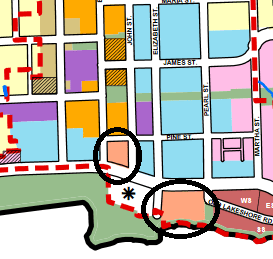 The South-East corner of Brant & James is a special policy area (thatched orange) allowed to go to 17 storeys. The North-East corner across the street has already been approved for 23 storeys. Existing permissions are 6 storeys, will now be up to 25. Height on the east side will be determined by depth of lot, with one storey for each 4.5m in depth. Existing permissions are 4-8 storeys, will now be up to 17. The block at Maria/Caroline/John/ Elizabeth has existing permission for a 17 storey condo (currently under construction), 6-8 storey parking garage and 6-8 storey medical centre. There are a number of historic buildings in the Downtown Core Precinct, along James, Elizabeth Pearl, but heritage protection policies and site specific reviews won’t come till the Area Specific Plans are complete in June 2018. We’re giving height away without getting these protections in place, putting pressure on these sites to be developed to the max. It will be difficult to “downzone” development permissions after the fact where we want to protect heritage down the road. Cannery Precinct, up to 22 storeys (salmon colour). Waterfront Hotel site marked with asterix. This precinct includes two parcels: the existing Bridgewater Development at Lakeshore/Elizabeth/Pearl, currently under construction with a 22 storey condo, 8 storey hotel and 7 storey condo; and the foot of Brant/Lakeshore on the North East Side bounded by Brant, John, Pine and Lakeshore. 26 storeys at Martha/Lakeshore: this application was not supported by council or staff, and was appealed to the Ontario Municipal Board; the hearing was in July and a decision has not been released. 22 storey at Brock/Ontario: this application is still being processed. A recommendation report to approve or deny is expected in the New Year. 6 storeys at Elgin/Locust/Blathwayte: the site allows 4 storeys which has begun construction; the applicant is seeking two additional floors. A recommendation report to approve or deny is expected in the New Year. 5 storeys at 2085 Pine: the project was approved by council this fall but hasn’t begun construction. The existing historic home will be preserved and incorporated into the development. Emerald and St Luke’s precincts (light pink) will now include semi-detached units. semi-detached units allowed in all low-density, single family home neighbourhoods. 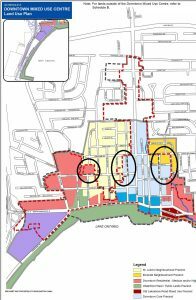 Since semi-detached units currently have different lot coverage and setback permissions, I asked staff to limit semis to the same lot coverage as single family homes, at 25%, and the same Floor Area Ratio as single family homes, which controls massing, to avoid monster semis covering most of the lot being built downtown. 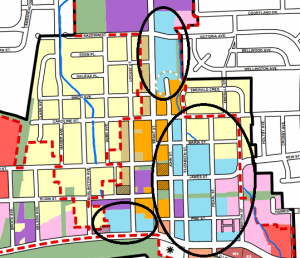 Those changes won’t be ready until the Area Specific Plan for the downtown comes back in June 2018. In my view we shouldn’t be approving semis until we have those specific details and controls on massing and lot coverage. The plan was first released in September, with the updated version released early November 9, which doesn’t reflect a number of changes that were suggested. The plan will be discussed at the Nov. 30 Planning & Development Committee meeting, in the afternoon (1pm) and evening (6:30pm) sessions. The plan is expected to be approved in January, with more detailed Area Specific Plans coming in June 2018. Any changes we want to see made have to be put on the floor by way of a motion at the Nov. 30 meeting. If this plan goes through as is it will fundamentally change downtown, replacing the low-rise character and historic buildings with modern tall buildings. The magnitude of changes represents overintensification and high rise congestion with no clear reason – since we can meet our growth targets under existing plan limits. We’re giving away height and getting nothing, like negotiating affordable housing, family units, public parking or heritage protection in exchange for more floors. Since the approval of the 23 storey building, residents have made clear they don’t support highrises throughout the downtown, and are very concerned about added congestion, loss of small town feel, and loss of key retailers in some of our older buildings, like Kelly’s Bake Shoppe. This process is proceeding far too quickly, and I will ask for an extension of time before approval. Though the Official Plan review started six years ago, half way through it completely changed from an update to a rewrite. We only got the downtown policies at the end of September, and only saw the revised version two weeks ago. 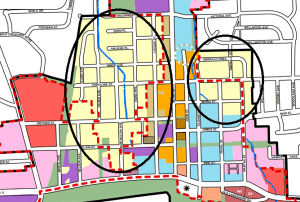 We won’t have the Area Specific Policies for the downtown until June. We should not be approving the plan piecemeal, without all the detailed protective policies in place. The new plan, downtown policies, staff reports and “track changes” version is over 2000 pages of reading for committee next week – and that’s just one item out of 74 reports and appendices across six meetings, including the 2018 budget. Three weeks is not enough time to review and digest these documents, much less invite public comment. We cannot rush. The Official Plan is the most important document in the city, setting the stage for development for decades. I will be asking for several amendments, including revisions to height permissions and deferring approval till June when we can consider all policies at the same time, and allow more time for public review and comment. You can help by speaking in support. Register as a delegate for Nov. 30 and speak up on what changes you want to this plan. Stop the insanity! Burlington will turn into Mississauga with these giant skyscraper. Brant St is a 2 lane road in the downtown core. Really? All of the proposed changes will make a few people rich at expense of the majority,and the inconvenience of the local residents . Marianne, has anyone done shadow studies on the impact that 30+ storey towers will have on surrounding neighbourhoods? We are about 400m from Brant Street in the new “Upper Brant Precinct”. I have nothing against going upward on Brant and Fairview in principle, but if it is going to be nothing but a wall of 30 storey condos along Brant (and how far inward?) will homes along Ghent, Prospect and Maplewood be looking at spending long parts of the day in shadow? Thanks to everyone for engaging in this important discussion. I want to encourage people to participate, so let’s keep it respectful of each other, and those who have a different perspective than us. Focus comments on the issue, rather than personal attacks or assumption of motives of city staff, other residents or anyone else. Such comments will be deleted. Staff put forward what they believe in their professional opinion is good planning. Anyone can agree or disagree with that position; state the rationale, rather that going after the person. Providing solid reasons for an alternative perspective helps us reach better planning decisions together. (PS I’ve posted this comment on all articles about issues which are contentious and people have different perspectives, to encourage vigorous and respectful debate). 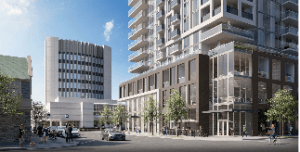 When a question was asked at a City Hall meeting about acceptance of the James/Brant 23 storeys as setting a precedence, the answer came back from one of the Councillors as not necessarily. 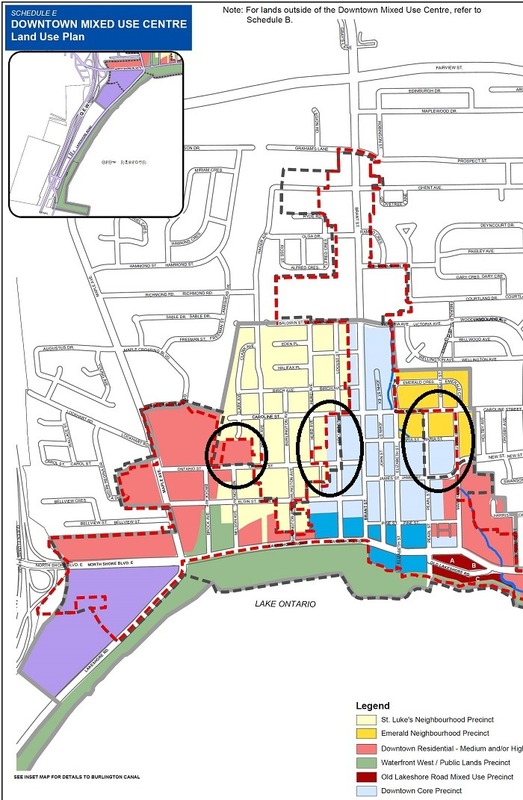 Well, again we are treated like “dummies”, and looking at the new Official Plan and the 17 storeys for Brant St., closer to the lake, and the “special requests” for 22 that are already numbered, is very clear to me what decisions have been made. What views, opinions, or rights, do you think citizen taxpayers should have on layout of their community planning? Comes loud and clear to me that we have a voice – yes, but it is only for “formality sake”, as this planning has been predecided and put forward with too high a number before any proposals by developers have evenbeen released for public comment. One developer already knows what height he is getting before the site area has even been sold to him. Does this tell us something, and answer a lot of our questions at the same time? This is not what the paying pubic want to hear or see. We want fairness, honesty, and “real” sensible planning for our downtown core. I would like to comment on the impact multistorey buildings would have on small retail businesses on brant street. Nobody likes to stroll around these buildings, small stores encourage people strolling by and stopping to purchase from these stores. What a mistake this would be! How can we read the Official Plan? Is it published online? Where? Thus city is being ruined. No one listens to any citizen delegate. Why this sudden burst of greed? Unfortunately it is not so sudden. I used to attend the town hall meetings a couple of years ago, but the voting citizens’s views are falling on deaf ears. It is very disheartening that our city is quickly being destroyed by all this development that keeps getting approved. Queen’s Park seems to be running the show, not the locals. The Burlington core continues to be destroyed by traffic congestion and the highrises will create wind tunnels just like downtown TO and Mississauga. I am sick and tired of council members who do not live in the downtown core making decisions that adversely affect those of us who live in the core. How would Craven like a 26 storey high-rise in his back yard? 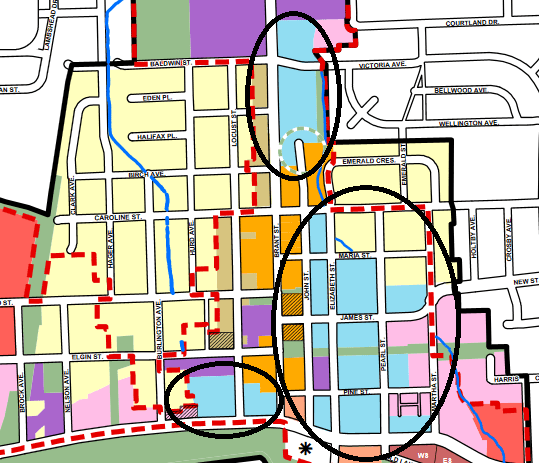 Actually, the Plains Road corridor would be the perfect place for high-rise buildings. 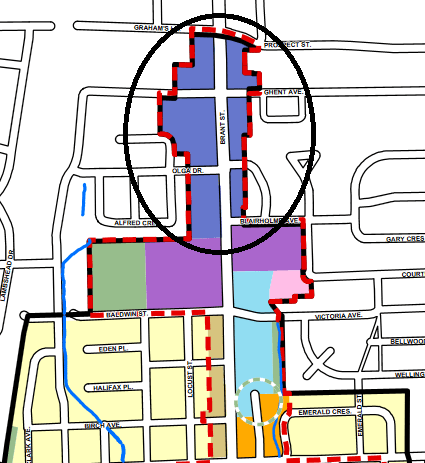 What about ther Fairview corridor in Dennison’s ward? As noted, we are on target for intensifcation without adding to the downtown congestion. It’s disheastening as the people who could vote these councillors out of office don’t seem to care that much about what happens downtown. That’s not true about people outside of downtown not caring about the downtown core. Myself and a number of other Aldershot residents care deeply about the intensification changes that are going on in the City of Burlington, including downtown. Aldershot itself is also facing big changes with the Aldershot GO Mobility Hub plans. 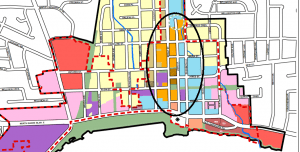 These plans suggest that Aldershot would be pre-approved to have 12-20+ storey buildings. The *Village* of Aldershot does not want to see these changes either. We already have a number of new developments in the area with under-sized retail space that isn’t attracting meaningful businesses — if they attract businesses at all. We are losing our Home Hardware and Dollarama not long from now, and are likely to lose the RBC not long after that. I agree with you though, that the councillors would be a lot more likely to take notice if these things impacted their own backyard directly. The best way to change the City Council is for everyone in the City to get involved with this and make their voices heard in the next election. The campaign finances from the past elections are all available through the City of Burlington website. You can see the corporate donations for each major candidate, and it isn’t difficult to spot the familiar names of developers on many of those donation lists. Googling “Burlington Candidate Financial Statements” should show the results you’re looking for. The one good thing to note is that recent changes have made it so that corporate and union donations are no longer allowed for municipal elections. This won’t change the fact that the owners can donate as individuals, but it should work to limit the donations a bit. This is so sad. We moved here a year ago, from a small town in the Maritimes, to be closer to family. We were drawn to Burlington specifically because of the small town feel, and the walkability of the downtown core. 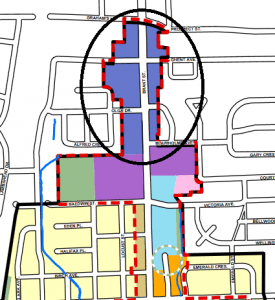 That will all be lost – the small retailers we prefer to patronize will be gone, and Brant Street will be a construction zone for the foreseeable future once the plan is approved and the developers smell big profits and swoop in. No one will want to stroll Brant Street, and you can bet that the throngs of people currently coming to the waterfront park will go elsewhere. We recently went to Dundas to see their main street – lovely, and not a high-rise in sight (same in Oakville). And so Burlington, recently lauded as one of the best places in Canada to live, will fall far down that list. There is no way now we will buy in Burlington, and we will look elsewhere once our lease is up. I’m surprised downtown homeowners are not up in arms: with all the construction and highrises looming over downtown neighbourhoods, I wonder if their property prices will fall. On a final note, while I’m surprised at the paucity of comments to this post, perhaps people are so disillusioned by the recent approval of 23 storeys on Brant, the thought of wading through 2000 pages of documentation by Nov. 30 (that’s in 5 days!) to speak at the meeting is just overwhelming. Why the rush? Why can’t the City learn from Chicago with it’s undeveloped waterfront or Paris, France where hi-rises are not allowed until 4 miles out of city. They could even learn from downtown Oakville! Jamming high rise apartments into the downtown is madness. Our roads and infrastructure can’t handle what we have now. Developers now control our city and all they are interested in is the almighty dollar. here is a thought why weren’t any high-rises built when they did all the cookie cutter town homes up on HWY 5 or The Orchid. Why do they have to be downtown, you think there isn’t any stores down there now wait it’s going to become a ghost town. Don’t need the Spadina and Front St mess. Corridors, north Brant St, Plains Rd, where I live, Appleby North, Upper Middle even along Dundas. 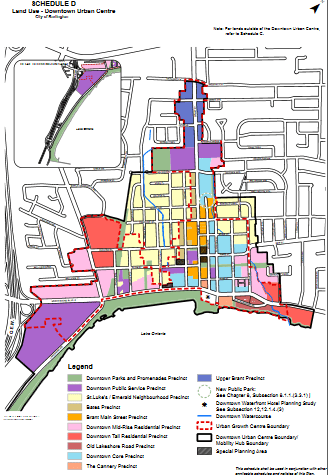 I don’t see the need to destroy downtown to achieve density and intensification targets. now can we get New St. back to 4 lanes as no one ever uses the bike lanes or is on the sidewalks all the time anyway. GRRR!